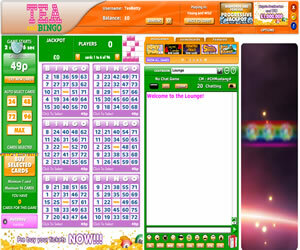 Tea and Bingo first opened their virtual doors in December 2009, and at the time they were powered by the Virtue Fusion software. In mid 2013 though, they emailed all of their players informing them that they would need to play through their balance, or withdraw it as they would be closing down from Tuesday 16th July and re-opening later in the year. Just a few short weeks passed, and in August 2013 they opened their doors to the public once again, this time as part of the Dragonfish network. The design of the home page has not really changed, it still uses the same white colour scheme with accents of green, pink and yellow. 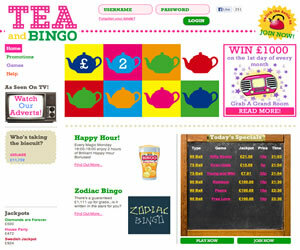 Tea and Bingo is a nice looking site with everything well laid out. There is a small menu in the top left hand corner of the screen, with the rest of the page made up of banners detailing their latest offers and promotions. Check the black board and you will find a list of 'Today's Specials' with direct links so you can pre-purchase your cards and take part even if you can't get online to play live. Unfortunately the re-launch means that all old players need to re-register, but on the plus side this does mean you can take advantage of the new welcome offers and first deposit bonuses. Signing up is a simple enough procedure and you will need to include your payment details but no money will be taken until you make your first deposit. If you already have an account on the Dragonfish network, you may find you will have to come up with a new username before they let you complete your registration. Head into the Tea and Bingo lobby and everything will feel very familiar. Down the left hand side of the screen you will find tabs for all of the different games they have to offer along with specials such as their Daily Jackpots and VIP reward scheme. Click on any of these tabs and they will reveal a whole host of rooms to choose from along with details of the next games jackpot, the card prices and the number of players taking part; All useful information you will need to consider before deciding where to play. The rooms themselves use the networks standard layout, but this is no bad thing as they have been tweaked to perfection over many years in the industry. The left hand side of the screen is dedicated to displaying your cards and they will be automatically sorted so the best ones are always near the top. To the right you will find a chat room where you can enjoy the social side of the game and have a chat with your bingo buddies or take part in chat games to win a bit of extra bonus money. 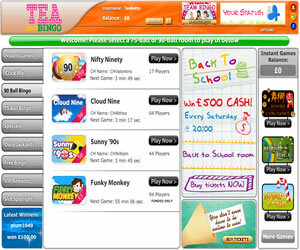 You can also access a selection of mini games and these can be played without it interfering with your bingo. There are always plenty of promotions on the go at Tea and Bingo, with a combination of big money games and prizes up for grabs. On the downside though, you will sometimes find the wagering requirements to take part in these promotions are higher then you would expect, making them only accessible to serious players with big budgets. If you do have a limited budget, make sure you take advantage of their free bingo as there is a whopping £6,000 to be won each and every month with some games even available to none depositing players. The change to the 888/Globalcom software has not really done anything to boost the appeal of Tea and Bingo. Swapping from one network to another may have bought with it a few more promotions but they are still lacking anything spectacular to make them stand out from the crowd. Tea and Bingo is the PG Tips of the online bingo world, it may quench your thirst for a while, but at the end of the day you will be left craving for a nice cup of Earl Grey! 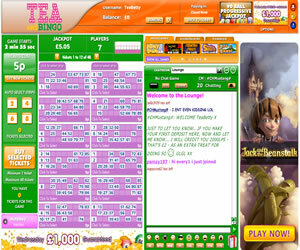 Tea And Bingo offers three variants of the bingo game at their site. Most games are either 75 ball pattern or 90 ball bingo but there are rooms that offer 75 ball five-line games too. You will find a selection of instant win games like slots, scratchcards and table games available, some of which can be played in the same room as your bingo. Deposits of at least £10 are required for cash match bonuses. Wagering requirements at Tea And Bingo are 4x the amount of deposit and bonus but you can withdraw prior to meeting these requirements. However, should you not have met the wagering then your bonus money in your account at the time of withdrawal will be lost. Before you can withdraw you must have deposited at least £30 into your account.